What if I mess up; what if everyone hates me; I know I will, I know they do; they probably think I’m so weird. What the hell are you doing? There’s nothing to be afraid of! God, there is; if there wasn’t, I wouldn’t be feeling like this. No sound escapes your chapped lips. Your pale, frozen hands are shaking. 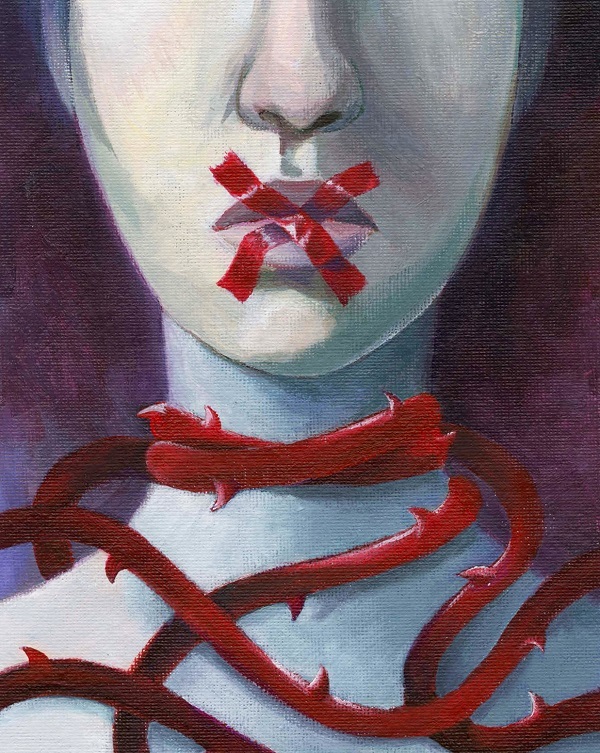 At the fear of having your voice quiver, you clamp your mouth shut, but in doing so, realize you’re forgetting to breathe. Just breathe, you tell yourself. Fingernails dig into the palm of your sweaty hand, sure to leave red marks. You don’t dare take a peek at the tiny pink crescents you know are there, feeling ashamed for causing yourself pain. You shiver, the sweat slicked over your body combining with the air-conditioned atmosphere to make you feel as ill as you sometimes think your mind is. “Are you okay?” you hear someone ask. They definitely think you’re a freak. “Yeah,” you lie. Your voice is muted, shaky, broken. Weak. You utter one word, and it still manages to be everything you wish it hadn’t been. Your ice-cold hands cover your face, attempting to cool down your now red-hot, set aflame cheeks. Maybe, next time, you shouldn’t attempt speech. Pamela Vaccariello is a 2nd year Literature student in the ALC program. Maggie Zeng is a first year Illustration student who enjoys both traditional and digital media. You can view more of her work through the following links: https://www.instagram.com/maggie.draws.stuff/; https://tapas.io/episode/1058764.